What is ARCA Sim Racing 08 (ARCA08)? What is the XPatch (ASRX or TSF Trucks)? How do I get started with ARCA Sim Racing (ASRX)? What vehicle models are available? How do I turn on/off spotter features? How do I turn on/off mirror options? Why don't the tire temperatures and wear change as I race? How do I change my driver name? The ARCA cars have approximately 700hp in the "twisted sister" stock car body. The Truck, Grand National, and Cup cars all vary according to their intent to simulate each NASCAR series. The trucks have less horsepower and the most aerodynamic drag. The Grand National car has similar horsepower to the truck, but has less drag and a lower center of gravity. The Cup car has more horsepower than the other vehicles and has much less downforce. The Cup car uses tires with faster grip loss. Truck bodies are laser scanned Silverados while the Cup car uses a model from Stock Car Evolution (SCE). 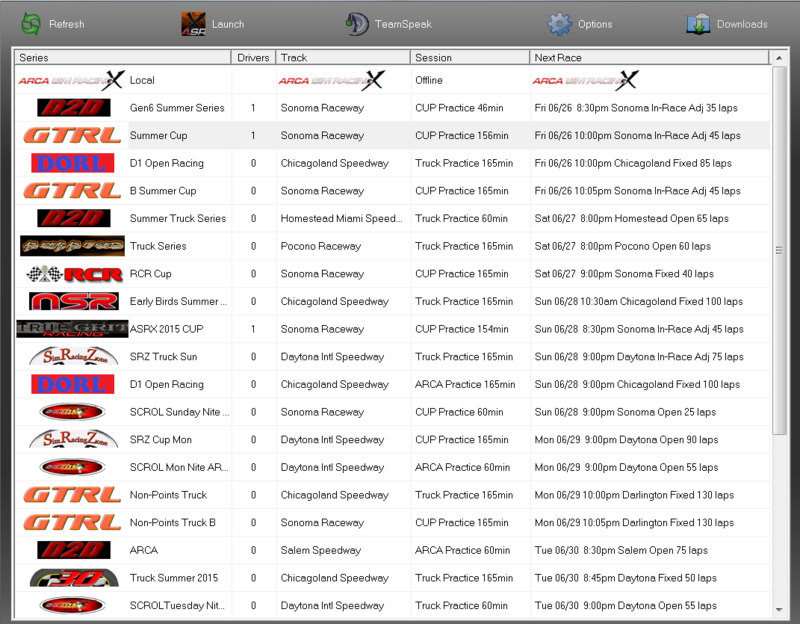 It is possible to run the complete Sprint Cup schedule. ARCA08 shipped with skins to mimic the 2008 ARCA racing season. ASRX contains default cars for numbers #00 through #100. Most leagues make available custom skins through the Launcher. You can create your own skins using provided templates and upload them using the Skin Uploader. Use the 'Options' screen in the ASRX Launcher to enable 'virtual miirors in cockpit' and to control what you see of your 'self in rearview'. To turn mirrors on/off, map a key to 'Toggle Mirror'. During qualifying and race sessions, the tire temperatures and wear are not shown in real-time. You can get a tire temperature reading during those sessions only after changing tires. After a tire change, the graphic shows the wear and temperature of the tires when they were removed from the vehicle.